How do you share your love for agriculture? Do you have a bumber sticker or a big cotton piece like this? 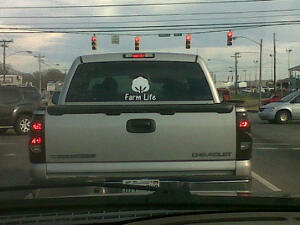 Driving around Tennessee I see so many Tennessee Agriculture Products plates. The plates fund the Tennessee Agriculture Development Fund, supporting youth organizations, Ag and forestry awareness, education, and marketing. The program does great work to help fellow consumers understand and appreciate agriculture. Does your state have a similar tag program, or programs to direct consumers to available food and ag services? We have gotexan.org which is the State of Texas website promoting Texas Agriculture. The State has also commissioned a Texas Agriculture Go Texan License plate.